When you need your vehicle repaired, you shouldn’t trust it to just anyone. Instead, you should call on one of the best auto body repair shops in North Staten Island. 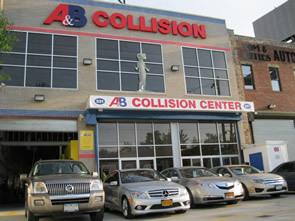 A&B Collision Center has been completing NYS car inspections and serving as the leading repair shop in Staten Island, NY and Matawan, NJ since 1946. You’ll quickly see why we have grown to have such a loyal customer base when you come to us. Estimate and inspect all visible damage when conducting NYS car inspections and provide you with a preliminary report on the condition of your vehicle. We will seek to get customer and insurance approval so that we can further investigate and assess damage with any necessary teardowns. Disassembly takes place right in our Staten Island, NY or Matawan, NJ repair shop. Make a list of all the parts needed to repair your vehicle and complete your order so that repairs can begin. Start making structural repairs and use our state-of-the-art equipment and lasers to measure the frame and get all unibody specifications back to their pre-accident points. Begin making body repairs in our repair shop in Staten Island, NY or Matawan, NJ. Our body repair department will replace any exterior panels, do any necessary metal work, and realign your vehicle so that it can move on to the paint department. Prepare your vehicle for painting and refinishing. The primer, sealer, color, and top coat will then be carefully applied. Reassemble the various parts of your vehicle and add final touches, like moldings and detail pieces. All of the mechanical and electrical components on your vehicle will then be tested and checked for accuracy. Finish the process off with detailing. Any dirt or dust accumulated during repairs will be cleaned up. The vehicle is now ready for a final road test and NYS car inspection. As you can see, we check everything before giving you back the keys to your vehicle, and we stand behind the work we do with a lifetime guarantee. Get in touch with us today to schedule a NYS inspection or auto repair at either our Staten Island or Matawan, NJ location.